When you visit Nyberg Orthodontics in Dover, NH for orthodontic treatment, Dr. Lynnette Nyberg and our team can use the iTero® intraoral scanner to see every corner and crevice of your smile. 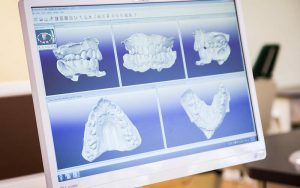 The scanner has replaced the need for dental impressions and helps us better evaluate your dental structure. We invite you to contact our orthodontist today to learn how your treatment can benefit from the iTero intraoral scanner in Dover, New Hampshire. Comfort: By doing away with messy impression materials, iTero allows patients to breathe and swallow with ease and is not accompanied by a bitter aftertaste. Safety: Instead of radiation, iTero uses a safe laser to generate images of your mouth. Accuracy: iTero’s precision scanning allows for a better fit when you receive Invisalign or a retainer. 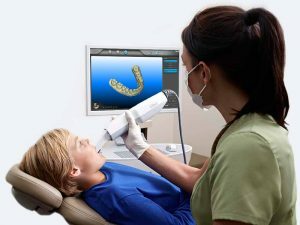 Speed: You can view the 3D scans immediately on the screen, and the lack of impressions reduces the waiting period for your Invisalign and other treatments. If you are considering Invisalign or another orthodontic appliance, we encourage you to visit our orthodontist office and experience for yourself the benefits of the iTero intraoral scanner. You are welcome to contact Nyberg Orthodontics today at 603.749.2900 to schedule a free orthodontic exam.